Maui is a shopper's paradise with its numerous galleries, international shops, designer boutiques and shopping malls not to mention its great farmer's markets and swap meets. Many carry Maui specialty items and products unique to Hawaii. These include hand-turned bowls and objects of beautiful native woods; oil paintings and sculptures, hats woven of lau hala; hand painted resort fashions; and one-of-a-kind jewelry, glass work, and art. The atmosphere of creativity and discovery can be attributed to the high numbers of artists, businesses and entrepreneurs who build lives of inspiration on Maui. Long the queen of specialty products, Maui has spread its wings to become one of Hawaii's premier all-around shopping destinations. Islanders fly in from the neighbor islands to hunt for treasure in the chic boutiques of upcountry Maui and the quirky antiques shops of Wailuku. Along the south and west coastlines, glamorous shopping and restaurant complexes offer the latest in European fashions and Maui style. The Shops at Wailea is Maui's newest and most glamorous complex, 150,000 square feet with more than 60 shops and restaurants in a Hawaiian architectural motif. European high fashion, shoes, furnishings, books, maps, sundries, beach wear, art, gift and gourmet items – they're side by side at this south Maui hotspot. With its artist and gallery receptions and live entertainment on Wednesdays, there's a lot more than shopping at The Shops. In Upcountry Maui's Makawao, the one main street, Baldwin Avenue, is lined with stylish fashion boutiques, wood-floored country stores, art galleries and unique gift shops, housed in the vintage architecture of a historic cowboy town. From a Japanese toy shop and Starbucks coffee bar in adjacent Pukalani, to exquisite glass-blowing demonstrations and upscale European linens along Baldwin Avenue, Makawao is full of surprises. Makawao's art galleries include Hui No'eau, the island's most prominent arts organization. In central Maui's Kahului, most shopping needs are centered in Queen Ka'ahumanu Center and Maui Mall, about 5 minutes from the airport. Maui Mall has a 12-screen movie megaplex as well a multitude of shops, and Queen Ka'ahumanu Center, the third largest in the state, offers more than 100 shops and restaurants. These centers offer home accessories, electronics, clothing, shoes, Asian imports, surf wear, books, toys, games and numerous options for ethnic and island-style foods. Several miles away on the road to Hana, with its own laid-back character, the town of Pa'ia is a colorful throwback to the '60s, with funky apparel shops and an arts cooperative among the many stores that greet you as you enter the town. Central Maui's Wailuku is coming out of the closet as Maui's shopping gem. This is a take-your-time, stop-in-every-store style of shopping, where in one leisurely stroll down Market Street, you can lose yourself in treasures from the past as well as edgy art galleries and contemporary gifts. Known as "antiques alley," Market Street purveyors offer a diverse range of cool finds: hot lattes and hard-to-find music, Italian shoes or locally designed apparel, vintage collectibles and exceptional aloha wear. Take out counters and cozy restaurant along Market and Main streets entice with hand-made pizza, Asian foods deli, hot noodles, sushi and local-style plate lunches. At Whalers Village in Ka'anapali, step right off the beach into a shopping bonanza: Coach, Louis Vuitton, Georgiou and other designer boutiques. Surf shops and aloha wear. Imports and top-quality made-in-Hawaii handicrafts. From upscale silk sarongs to flip-flops and sundries, from cameras to pearls for that special night out, you can satisfy all of your needs at the Village. If you're shopped out, slow down at the whale museum, or in one of the oceanfront restaurants. 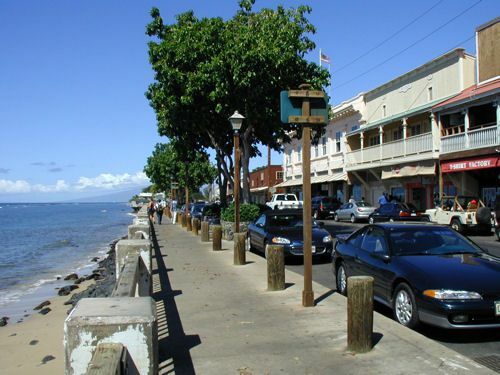 Lahaina is one long shopping fantasy, a string of boutiques and restaurants that line the shoreline of this historic town. Lahaina's shopping centers include the galleries, food shops and clothing stores of the Lahaina Cannery Mall; the Outlets of Maui in Lahaina, and the Old Lahaina Center, as much a dining and entertainment nexus as a must-see for shoppers. At the Outlets, popular national chains share space with local emporiums of aloha wear and gift items, and a bevy of eateries. Front Street is lined with boutiques and galleries with something for every budget, from fine art to trinkets, from plumeria soap to aloha shirts. Art Galleries: Maui has a high concentration of art galleries – more than 50 – and an active community of artists and craftsmen who share their work in all media. Luminous hand-turned woods, fiber arts, sculpture, painting, jewelry and hand-blown glass turn up in surprising places. In outdoor fairs, upscale resort shopping villages, and successful artists' cooperatives in towns like Pa'ia and Makawao, the arts of Maui are an island signature. East Maui's Hana has one of the most culturally significant galleries in Hawaii, impeccably curated to honor the finest island artists. Farmers Markets: From Kahului to Kihei, farmers markets and swap meets bring out local artisans with the wide-ranging wares: baked goods, hand-turned woods, handmade jewelry, vintage collectibles and things Hawaiian, and the made-on-Maui botanical products that are making their mark in the beauty and wellness field. Numerous craft fairs, many that support worthwhile nonprofit organizations, are a common and popular attraction for visitors and residents who can browse and buy a diverse range of handicrafts and tasty treats. Food and agricultural products: Grown in fertile upcountry soil, Maui onions, specifically Kula onions, are famous among foodies worldwide. Kula onions are the crème de la crème of Maui food products, renowned for their sweetness and coveted by savvy chefs who cart them off the island by the bushel. Maui potato chips, goat cheese, gourmet preserves and vinegars, made-on-Maui wines, coffee, specialty sugars, and the sturdy, otherworldly, upcountry protea blossoms and lavender are among the excellent gifts to go.